A white patch found on the mucosa anywhere in the body. In the larynx, leukoplakia is most often seen on the vocal cords, either in long-time smokers or in individuals with some other cause of chronic inflammation. Leukoplakia is the descriptive term for what, on biopsy, may prove to be keratosis, carcinoma in situ, or carcinoma. 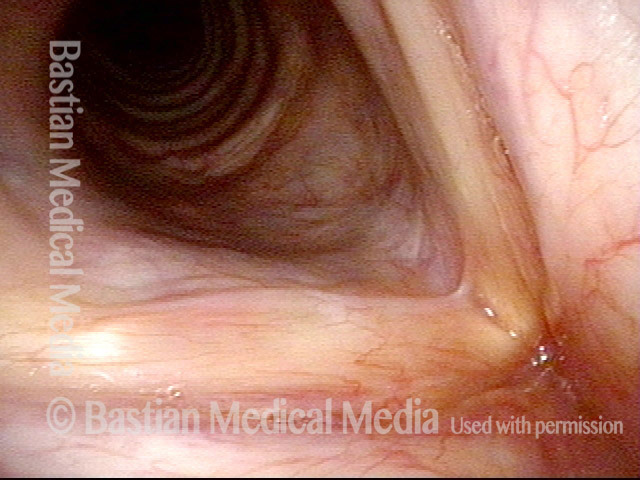 Leukoplakia, left vocal cord (right of image), standard light. Diffuse leukoplakia (seen under standard light) in a man who had undergone removal elsewhere at least twice, with rapid return of diffuse disease on both vocal cords. Closer view, using narrow-band illumination. Leukoplakia is accentuated, but punctate vascular markings are also accentuated. We sometimes call this “HPV effect,” though in fact this man’s HPV subtyping was negative. Two years after one superficial yet intensely precise peeling of the leukoplakia, plus one follow-up thulium laser ablation of scattered residual disease. The patient, a tenor, considers his voice to be normal. Closed phase of vibration, as seen under strobe light. 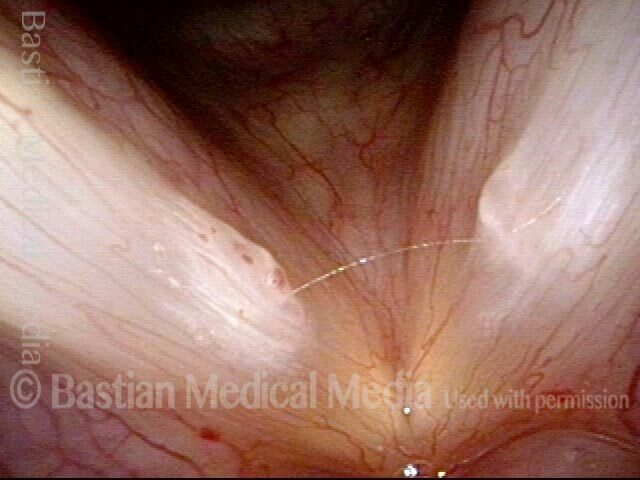 Open phase of vibration, demonstrating that the mucosa on both vocal cords remains flexible. The shifting hazy patches seen here and in photo 3 are collections of mucus. Leukoplakia, recurrent, in a former smoker, several years after initial diagnosis. The patient has had this removed in the operating room several times elsewhere, and pathology has only shown hyperkeratosis. HPV testing is negative. Notice both the “cake icing” (green arrows) and “spilled milk” (white arrow) components of the leukoplakia. At this examination, the patient is severely hoarse. 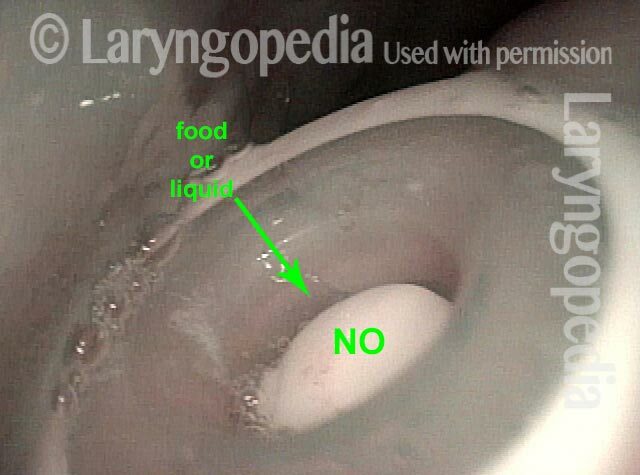 Closer view, under narrow-band illumination, which accentuates in particular the “spilled milk” component (arrows) of the leukoplakia on the left vocal cord (right of image). In the midst of coagulation using the thulium laser, delivered via glass fiber (right of image). The thulium laser session is done. 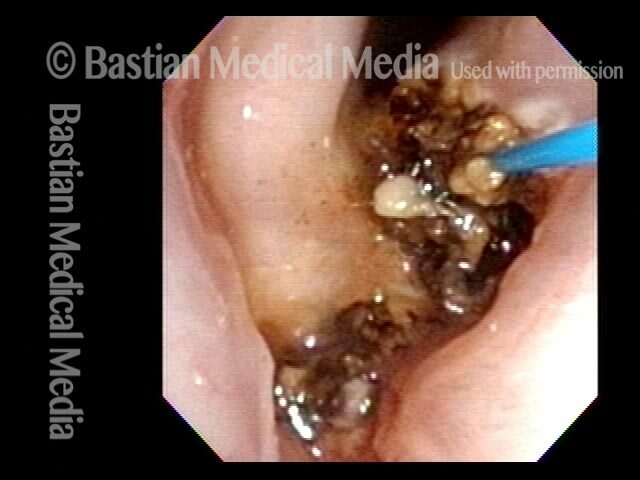 On the left cord (right of image), mostly near-contact mode was used, and the coagulated tissue, which has gone from leukoplakia-white to coagulated-white, will slough off within days. 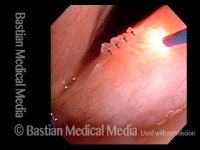 On the right cord (left of image), contact mode was used, to coagulate more deeply and detach the bulkier lesion. An additional surface layer will also slough on this cord. A year and a half later, after a few interval laser treatments, there is a small persistent patch of leukoplakia. At the conclusion of another thulium laser procedure, using brief contact mode for superficial detachment of the patch of leukoplakia. Fourteen months after photos 5 and 6. After roughly a dozen treatments spanning more than a decade, the voice sounds effortless and has no syllable dropouts. It is mildly husky but entirely satisfactory to the patient. Note how well-preserved and “unscarred” the superficial vascular pattern of the mucosa is (arrows), after so many surgical procedures. At the conclusion of thulium coagulation of this linear patch of leukoplakia. Arrows show the line of coagulated tissue. Three months after laser treatment, the patient has healed. Three months after laser treatment, a close up view shows no signs of leukoplakia spots. A few years earlier, this patient underwent superficial laser cordectomy of the right vocal cord (left of photo) for cancer. The voice result is excellent, and the patient is being seen this day for a routine interval examination, and has no new complaints. At closer range, tiny points of leukoplakia (inside the green dotted oval) become evident. The bright white spot in the photo is just a light reflection. Still closer view, again confirming the tiny patches of leukoplakia. There is another light reflection in this view, right in the middle of the photo. Thulium laser coagulation of the leukoplakia lesions, through a glass fiber (blue-ish cylinder at top-right of photo), as seen under narrow-band illumination. The Thulium laser had been placed on stand-by prior to the routine examination, to save the patient a potential second visit. The coagulated tissue is also white, but will slough off within a few days, and along with it, the leukoplakia. Abducted breathing position, standard light. Notice not only the margin swellings (nodules) but also the ectatic capillaries and the roughened leukoplakia. This person illustrates well the idea that vibratory injury can be manifested differently. Many express the injury more in the form of sub-epithelial edema and other changes; this person also has considerable epithelial change. Partial resolution of mucosal injury as a result of behavioral changes directed by a speech pathologist. Strobe light, open phase of vibration. Strobe light, moving towards closed phase of vibration. Panoramic view, standard light. Note general inflammatory appearance, left vocal cord leukoplakia, interarytenoid pachyderma. Some would call this a sulcus. 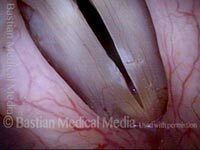 Furrow-like groove best seen on the left vocal cord (arrow). Beneath the arrow is the leukoplakia. Notice loss of fine surface vessels in this area. Strobe light, closed phase. Note the slight gap; this is often seen as a kind of pseudo-bowing with furrow. The leukoplakia here is heaped up in three main areas, as what some might call "cake-icing" leukoplakia. With this view only, a person could easily overlook the second component of "hazy" or "spilled milk" leukoplakia shown in the next three photos. All of this leukoplakia would be considered "bland" and non-threatening because there is no component of vascular prominence or erythema (erythroplasia). Erythroplasia would much more strongly indicate the need for biopsy. Pre-phonatory phase, showing mild bowing of the vocal cords. There is also the hazy leukoplakia component indicated by the dotted line. Vocal cords are in the nearly closed phase of vibration. The bluish light from the strobe light makes the hazy leukoplakia even more evident (indicated by the dotted line). Open phase of vibration, shown under strobe lighting. Leukoplakia of the vocal cords in a patient radiated years earlier for glottic cancer. This disease is mostly benign, but foci of carcinoma-in-situ have also been removed twice in the operating room, yet with rapid return of leukoplakia. The patient has had no glottic voice. In an effort to avoid total laryngectomy, we are managing these visual abnormalities with the thulium laser in an outpatient videoendoscopy room. Since this patient cannot tolerate aggressive laser therapy with topical anesthesia alone, we are here adding injection of local anesthetic. Note the blanching of tissue surrounding the needle. Further injection of the local anesthetic. At the completion of aggressive laser coagulation of abnormal tissue. Compare with photo 1. The patient will return in a month for additional laser treatment as indicated.